“Anything is possible once enough human beings realize that the whole of the human future is at stake.” The words of Norman Cousins, American activist and peacemaker, echoed over and over in Jessica Lang’s “us/we.” A farewell piece for her company, Jessica Lang Dance (which is currently on its final tour following an eight-year run), “us/we” was the first on a diverse program presented by the Ogden Symphony Ballet Association at the Val. A Browning Center this weekend. A delicious visual experience, “us/we” was a series of snapshots that zoomed in and out on Brooklyn, New York. 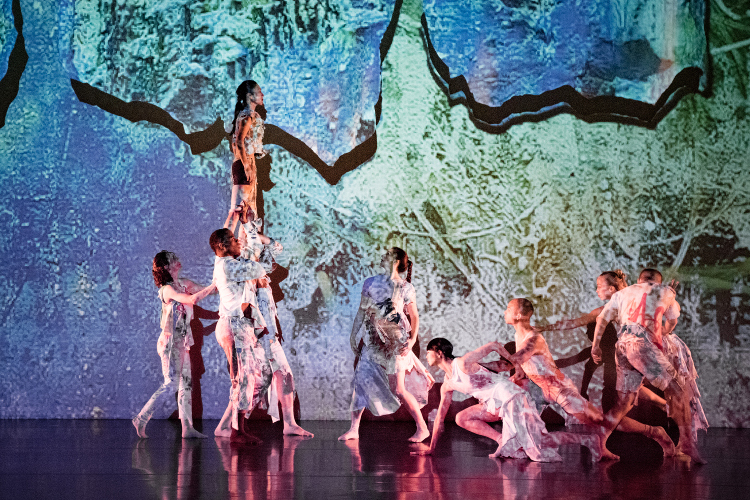 The piece, created with visual artist Jose Parla, featured colorful projections that filled a screen upstage, framing the dancers and at times covering them with projected light. In a phone interview last week, Lang spoke with this writer about the “layering patchwork” of “us/we.” “It’s all tied together,” she said, which became clear throughout the driving work. “us/we” spoke to a sense of unity by joining different people, places, and histories, and resonated through the dancers, who didn’t spend much time standing still as they moved between club scenes, busking scenes, and many literal tableaux, while incorporating gestural movement resembling American Sign Language. Notably, the piece coordinated large groups for impressive, multiperson partnering that had a flair for the dramatic, blending ballet and cinema. The snapshots of “us/we” moved quickly, transitions almost nonexistent between, say, a dance scene set to Ram Jam’s “Black Betty” and a moodier contemporary sequence. Quick changes of pace, glimpses into relationships, and hints at iconic moments re-created the feeling of riding public transportation: I remembered visiting New York for the first time, and the thrill of watching the city rush by on the subway, my face pressed against the window. After speaking to Lang about “us/we” and then experiencing it, I see it as a love letter to the company: it is the last piece Lang will have made with the dancers, before all move on to the next stage of their respective careers. Near the end of the piece, the dancers appropriately sang “Can’t Help Falling in Love.” With crescendos and brief moments of quietude, “us/we” was a lovely symphony of New York, and by extension, the world. Arguably Lang’s most recognizable work, “The Calling” is a beautifully clear haiku of isolation and longing. Julie Fiorenza performed it with articulate grace and a length that defied that of her actual limbs. Compositionally, “Thousand Yard Stare” was the most readable of Lang’s work on the program. In it, she repeats and re-creates scenes spatially as well as gesturally, making it easy to telecast personal or imagined relationships onto the dancers. There was a moving moment when a dancer was left out of the fold, powerful because the dancers were rarely alone throughout the piece. Their mass of overlapping bodies quickly pulled her back in, lifted her over their heads, and, surprisingly, tucked her in between them as if placing a baby bird back in its nest. It is easy to imagine why “Thousand Yard Stare” is one of the company’s most- performed pieces. Set to Beethoven’s String Quartet No. 15, Op. 132, its music and movement swim together in hope despite the inevitability of death. 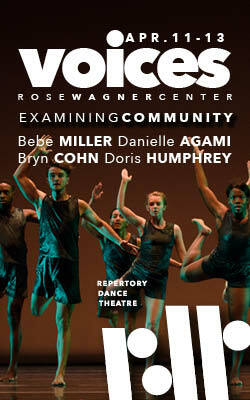 The dancers moved as a unit, offering the audience a sense of humanity and redemption. It would be easy to make a dance that captures the brutality of war, but for “Thousand Yard Stare,” Lang was interested in a different approach. ”We still have to carry hope,” she says. She chose the music in part because Beethoven wrote the piece while he was dying, looking at the end of his life. Lang’s care and empathy are visible throughout it, and it’s a piece that does for me what I aspire to do for others through my own dance making: it softens me; nudging me toward an understanding of the things I do not know. Ogden Symphony Ballet Association presented Jessica Lang Dance at Weber State University February 2, 2019.